Sandy has hit and wrought havoc in eastern coastal areas. Some places are reported to be still under waist deep water with no power supply over 24 hours. Before the impact of Sandy could wear out in US, another cyclone called Nilam has hit the Tamil Nadu coast in India. Conditions there are in total mayhem with 8 people already dead and scores of people affected by the heavy damages. The way world is in total turmoil right now, I can only feel the prophecy made in the movie Doomsday looming larger in our near destiny. What you guys will do if you ever come to know of the world ending a month after? I, for one, would pack off my bags, go to Kolkata and gather up with my friends and relatives to have a feast and will spend the last few days in merriment eating, drinking and dancing. What say!! No point in sulking over something not within your power, so the best is to accept the inevitable with open arms. Anyway, the following rohu preparation I learned from my mother in law. She cooked this curry when the last time we paid a visit, some 7-8 months ago. It was so tasty that I ate one bowlful of this curry with 3-4 fishes in one go. 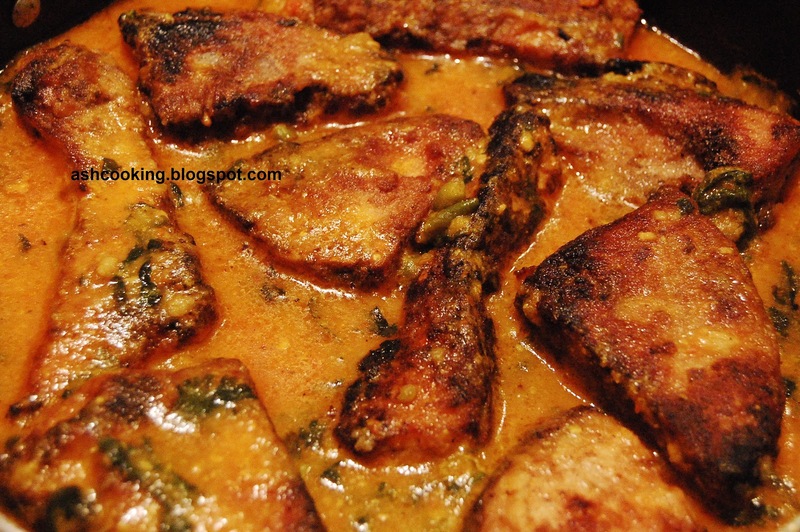 1) Marinate the rohu pieces with lemon juice, salt, black pepper and garlic paste. Refrigerate for an hour. 2) Heat oil in a wok. Smear the fish pieces in corn flour and shallow fry. Keep aside. 3) You may use the same oil used for frying the fishes to cook curry, or you may toss that away and heat oil afresh for the curry. Into the oil, add 2 split green chillies and allow them to sputter. 4) Then add tomato puree and coriander leaves. Add salt, turmeric powder, green chillies and the residual marinade into the wok. Sauté the mixture for 5-8 minutes. 5) Add 2 tsp corn flour and grated cheddar cheese. Pour 1 cup of water into the wok and bring the gravy to a boil. 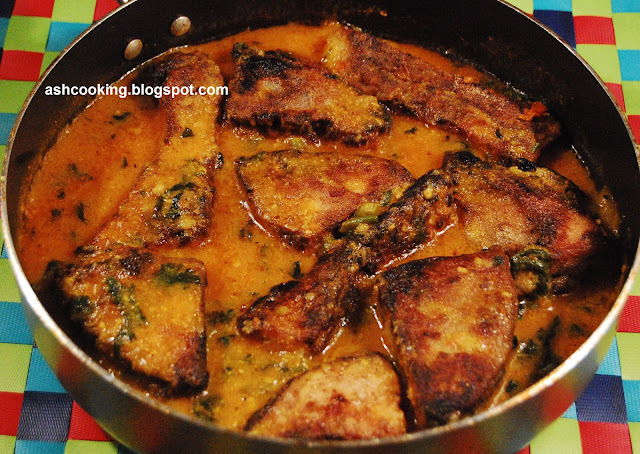 6) When the gravy reaches the desired thickness, toss the fried fishes in and cook covered on low heat for 2 minutes.